The Superb has a smooth, comfortable drive on the roads with a good mechanical grip and stability control to counteract understeer. The Superb offers more space than most comparable car types, with a lower price and high value retention. The Skoda Superb is a by product of the desire for an economic modern family car saloon by Volkswagon. The new Skoda Superb is lighter than previous models and much improved compared to earlier versions. 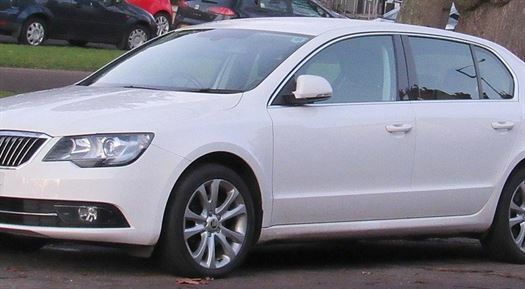 This is the third generation of Superb, whereby the first (2001 – 2008) and second (2008 – 2015) generations were both built on stretched versions of contemporary VW Passat platforms. It is a spacious wagon, with a ‘twindoor’ whereby the tailgate can be opened either as a saloon-style boot or a full lift back for luggage handling and numerous extra optional features. The newer version is focussed upon being stylish, rather than size, thus distinguishable from the Skoda Kodiaq and Karoq. The estate format, offer maximum boot volume nearly 2000 litres, over taking the wagon variants of a BMW 5 Series and a Ford Mondeo, being more fuel efficient by upto 30%. The hatchback starting price is just over £20k. The 148bhp 2.0 TDI spec, is the second of a five-strong range and fitted with the oil burner that is the most popular choice in both hatch and estate forms. Ingenuity and flexibility is provided by the modular potential of VW’s MQB platform, whereby the Golf’s platform has been deployed beneath the new Superb, and whilst the completed Skoda is 23mm longer than its predecessor and its wheelbase has extended by 80mm. Majority of the additional length is concentrated in the voluminous boot, where Skoda’s luggage compartment in the class, is now at 660 litres, which is 85 litres more than before with the rear seats up. This is much more than Insignia Sports Tourer, Mondeo Estate and 5 Series Touring, and Mercedes-Benz E-Class Estate. This is particularly beneficial to the hatchback version, which offers an improved 625 litres as recompense to buyers for losing the Twindoor boot access. 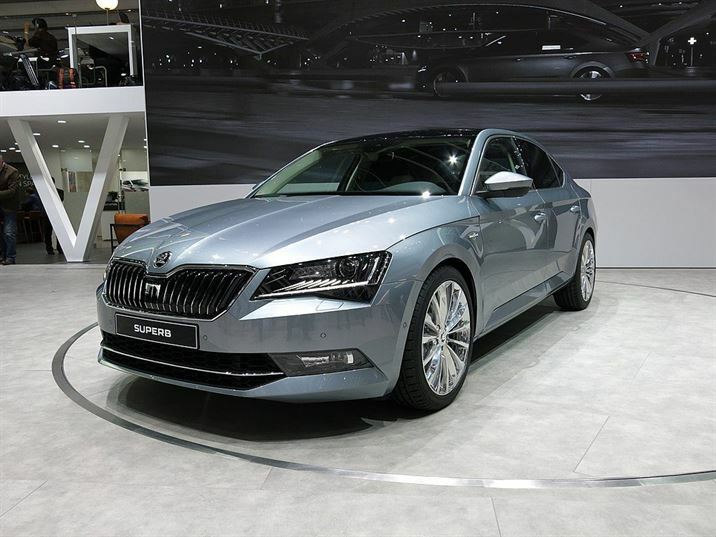 The new Superb has emerged as a proportioned model, with a lower front end and almost 50mm of additional width. The leg room remains constant whilst the greater width transfers to the additional elbow room for passengers in both front and back rows. The lighter body is due to a proportional doubling of the high-strength steel content leading to further stiffness. The suspension has been comprehensively reconfigured, with a new multi-link lighter rear axle. The Superb’s handling response is aided by the latest version of VW’s XDS+ electronic stability control system, a torque vectoring system that now activates at a lateral acceleration of just 0.15g to subtly brake the inside wheel when cornering. As an alternative to front-wheel drive, the Superb can also have again be had with all-wheel drive on the more powerful engines; its adaptive torque split facilitated by a fifth-generation Haldex clutch. Power comes from the broadest selection of Superb engines. The 123bhp 1.4 TSI props up the range, but it’s the updated 1.6-litre and 2.0-litre diesels that dominate sales. The 2.0 TDI is available in 148bhp and 187bhp variants, both of which can be had with a dual-clutch automatic gearbox and four-wheel drive. While the 118bhp 1.6 TDI is available in Greenline eco-efficient form. The Superb will be the first Skoda to gain a plug-in variant in 2019, when the car adopts the Passat GTE hybrid powertrain from the Czech brand’s parent firm. The Skoda’s Super cabin is well equipped and spacious with a luxurious material. The hatchback or estate bodystyles make is a suitable large family car, with plenty of leg room and boot space, much larger than a Ford. A large glazed area and a widely adjustable driver’s seat make for a good view out in all directions. The cargo bay in the estate car, has a loading height of 820mm, provides much more room than corresponding Mondeos which is 120mm less. – Entry-level S models comes with 16in alloy wheels, front fog lights, rear LED lights, tinted rear windows, electric windows, and electrically adjustable and heated wing mirrors fitted as standard on the outside. Inside there is air conditioning, manually adjustable front seats, a cooled gloved box and Skoda’s Swing infotainment system complete with a 6.5in touchscreen display, DAB radio, Bluetooth and USB connectivity. – Upgrade to the SE trim to receive a 17in alloy wheels, climate control, rear parking sensors, adaptive cruise control, two umbrellas, auto wipers, Smartphone integration and an 8.0in touchscreen infotainment display included as standard. – The mid-level SE L Executive models come with bi-xenon headlights, 18in alloy wheels, leather upholstery, heated front seats, a DVD drive and sat nav, while the newest trim – Sportline – comes with a sporty body kit, 19in alloy wheels, Alcantara upholstery, electrically adjustable seats and ambient LED interior lighting. The range-topping Laurin and Klement gets numerous additional luxuries including tri-zone climate control, all-round heated seats, a Canton sound system, adaptive dampers and a range of Skoda assistance systems – such as lane assist, self-parking mode and an automatic opening boot lid. The more efficient Greenline versions of the Superb model receives 17in alloys, a tyre repair kit and a rear spoiler added to the package. Skoda has multimedia features which offer its own 4G wireless hotspot, multimedia remote control from a paired tablet or Smartphone, a Canton premium audio system and even a TV tuner. The Columbus multimedia standard system has a good sized 8.0in touchscreen and makes the navigation system easy to follow. SE trim has a Bolero multimedia system with a 6.5in colour screen but no fitted sat-nav. Skoda’s SmartGate Smartphone mirroring option works with the standard system as with the optional one. The Superb Estate performs well and recorded a sub-9.0sec sprint to 60mph, comparable to a Jaguar XE or Mercedes-Benz C-Class which have a 25% power advantage. The Superb is flexible, taking 12.1sec to accelerate from 30-70mph in fourth gear, whereas it needed almost 14 seconds for a comparable test for the Mondeo. The 2.0-litre diesel engine is usually not very noisy, accelerates smoothly from 1200rpm to 1600rpm, after which the engine’s 251lb ft of torque has the power to handle a fully laden cabin, a heavy load or a trailer in the shorter intermediate gears. The engine revs cleanly to 4500rpm before it starts to run out of power. The brake pedal action is well tuned, with good initial response transforming into progressive retardation without the need for too much pedal pressure. Android Auto, CarPlay and MirrorLink – it allows many of the apps on your phone to be relayed directly to the multimedia screen, without the need for a sat-nav. The Superb has a smooth, comfortable drive on the roads with a good mechanical grip and stability control to counteract understeer. The Superb offers more space than most comparable car types, with a lower price and high value retention. Unusually, the number of optional features is quite high, examples include, adding metallic paint, bi-xenon headlights, a reversing camera, the partition net screen, a folding front passenger seat and remote backrest releases. The Superb’s fuel economy could be improved, with the 47.2 mpg approx 15% lower that similar competitior cars. The Greenline version of the model, twinned exclusively with the 1.6 TDI, offers sub-100g/km CO2 efficiency and76.4mpg combined. 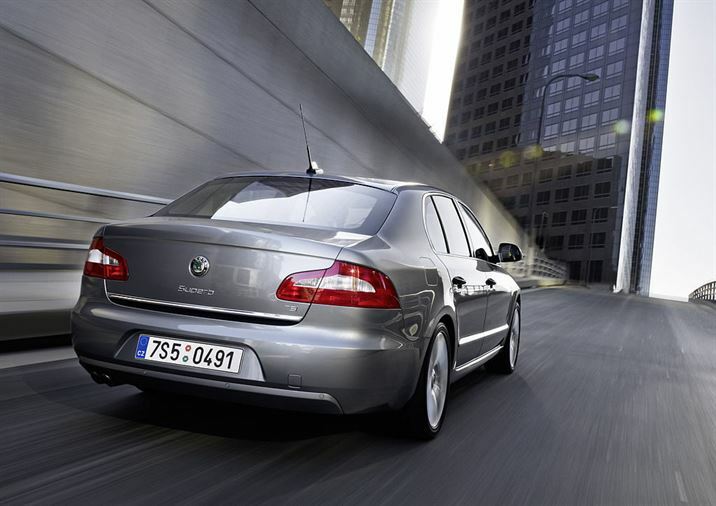 The Skoda Superb is one of the most popular family cars in the world. The Superb is a top range cost effective family model, with plenty of space, refinement and quality of a premium saloon. It is comparable to brands such as Ford Mondeo, Mazda 6, VW Passat, BMW 5 Series and the Mercedes E-Class. The Superb’s four-cylinder petrol and diesel engine models are focused on low-running costs. They can be fitted with a manual or DSG auto gearbox, and front or four-wheel drive. A 1.6 TDI Greenline option has longer manual gears, low rolling resistance tyres and aero tweaks to improve economy and drop C02 emissions below 100g/km. The Superb’s interior is crammed with creative features, like umbrellas stored in spaces in the doors, an ice scraper hidden in the petrol filler flap and the latest safety technology (adaptive cruise control, lane-keep assist and park assist). The Superb comes in five trim levels, starting with the S entry model. This is not lavishly equipped but does feature electric windows and mirrors, height adjustment on the front seats and manual air conditioning, plus a DAB digital radio, Bluetooth and a five-inch colour touchscreen. The SE has a chrome grille, climate control air-con, cruise control, rear parking sensors, an upgraded 6.5-inch touchscreen-operated infotainment centre and an umbrella in the door, SE Business and SE L add Alcantara and leather upholstery, plus sat-nav and drive mode selection, while the range-topping Laurin & Klement model has an even bigger touchscreen, plus a 10-speaker sound system, electric front seat adjustment, dynamic chassis control and a host of other luxury features. The SportLine model adds tinted windows, a black grille, 19-inch alloys and a subtle body kit, with the most powerful petrol or diesel engine under the bonnet. The Superb’s mission is to be an executive limousine for the masses, so the focus is firmly on comfort and refinement ahead of pin-sharp driving dynamics. Diesel options start with a 119bhp 1.6 litre engine, which takes 9.9 seconds to reach 62mph and has a top speed of 129mph. The sprint slows to 11 seconds with DSG auto transmission or in tax-efficient Greenline trim. The 2.0-litre TDI comes in 148bhp and 188bhp variants, the former offering 0-62mph in 10.9 seconds with manual gears, 8.9 seconds with DSG, or 9.0 seconds with four-wheel-drive. Top speed for all three options is comfortably over 130mph. The punchier 188bhp 2.0 TDI does 0-62mph in 8.0 seconds with a maximum speed of 147mph. The 0-62mph sprint time drops to 7.7 seconds with DSG, or 7.6 seconds with 4×4. The 148bhp 2.0 TDI, strikes the best balance between performance and economy. Petrol options include 124bhp and 149bhp 1.4-litre TSI variants that do 0-62mph in 9.9 seconds and 129mph, or 8.6 seconds and 137mph respectively. A 2.0-litre TSI unit is available in 217bhp or 276bhp guises (both with DSG, the latter with 4×4 only), which offer 0-62mph in 7.0 or 5.8 seconds and 150mph+ top speeds. The 1.6 TDI is the cheapest Superb to insure thanks to a group 12 rating, although the Greenline is group 13. The mid-range performers fall into groups 18/19, while the 187bhp TDI is group 24 and the performance flagship 276bhp 2.0 TSI is group 27. All models have a standard set of features such as DAB radio, air-conditioning and Bluetooth connectivity, while SE Business models add dual-zone climate control, parking sensors, a touchscreen sat-nav system, adaptive cruise control and privacy glass for the rear windows. All cars come equipped with a dash-mounted touchscreen, with S models getting the basic five-inch version, SE’s getting a 6.5-inch unit and SE Ls and L&K models boasting a superb eight-inch affair with a feature-packed Columbus sat-nav. The new Superb is the safest Skoda ever built and should match its predecessor’s excellent reliability. The new Superb is also the most technologically advanced and safest Skoda ever built, with a vast range of crash-prevention systems. This resulted in a strong five-star performance in the EuroNCAP crash tests, when adult and child occupant protection were both awarded an 86% rating. The safety features of Superb include blind spot detection, to prevent you changing lanes when another car is in the danger zone, and lane assist, which nudges the steering wheel automatically to keep you within the white lines demarking your lane. All Superb’s come with a three-year warranty but the cover is capped at 60,000 miles. The most efficient model in the Superb range is the GreenLine diesel. Based on the regular 118hp 1.6-litre unit already available in the Superb, longer gear ratios, low rolling resistance tyres and aerodynamic improvements bump its fuel economy from 68.9mpg up to a highly impressive 76.4mpg, and drop CO2 emissions below 100g/km for both hatchback and estate models. Skoda expects the 148hp 2.0-litre diesel model to be the most popular model in the UK. It accelerates from 0-62mph in approx 9.0 seconds, 135mph is legal limit speed for cruising. The Superb is capable of returning 68.9mpg and CO2 emissions of 109g/km. The 2.0 TDI is a popular engine now, but one that never fails to impress. The Skoda Superb is a great car for the Taxi Drivers due its spacious passenger area. Save on fuel costs and value for money.